If you write iOS apps and wonder how your earnings compare against those of other developers – or you have an idea for an app, and are wondering whether it’s worth pursuing – it can be tough to find any hard information. We hear occasional stories about hugely successful apps like Flappy Bird making hundreds of thousands of dollars per day, and we know there are some apps with literally zero downloads to their name, but what about the middle ground? It’s worth noting, of course, that developers who choose to share their earnings in this way are, by definition, successful ones. Nobody is going to share embarrassing numbers, nor think they have anything to offer in the way of useful guidance to other developers unless they have themselves been successful. So the numbers shared will not be typical, but the lessons learned may well be helpful to anyone looking to emulate their success. Let’s start with Unread, as it was Sinclair who kicked off this budding trend – and while he achieved a worthwhile income from the app, there are no telephone-number style earnings here. Sales hit $10k in the first 24 hours, but six months later they had only totalled just over three times that, at $32k (plus a further $10k for the iPad version). Which leads to one obvious conclusion: if you were thinking about a discounted price to help get your app out there, think again! So other factors played their part, but launch sales dwarfed everything else – even having Apple pick it as iPad Game of the Year! Note in particular that winning an Apple Design Award–which you might think would be a huge deal – resulted in only a modest uptick for a short time. A subsequent sale price, halving the price from $4 to $2, had a bigger impact. You can also see that, in this case, halving the price during a sale was very worthwhile, roughly quadrupling sales briefly. You might also imagine that having your app featured by Apple in the App Store would be the holy grail. Not so, says Sinclair, who concluded that blog coverage is more important. Anyone thinking that writing an app is an easy path to riches can also think again. Dash developer Kapeli–whose app grossed just under $275k last year–kept very detailed data on his working hours. While there are peaks and troughs, you can see that you’ll need to be prepared to put in the hours while developing the app. 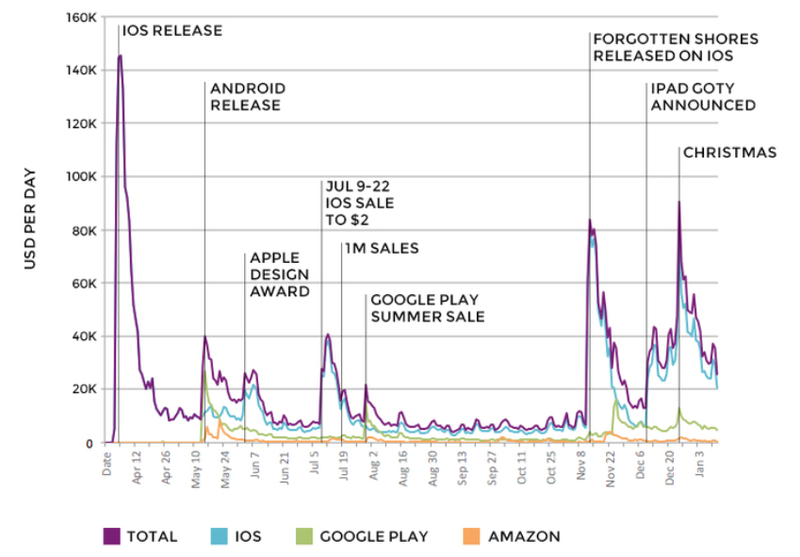 Expenses, too, can be significant for a high-grossing app. Ustwogames reports that they had eight core team members working on the app, with the original version requiring 55 weeks of development. The Forgotten Shores follow-up app took a further 29 weeks. Between the two, development costs totalled a cool $1.4M. Even at a far more modest level, doing everything yourself, don’t imagine the only costs are your own time. The Dash website notches up hosting bills of $2400 a year. What if you’re one of those people who has an idea for an app but doesn’t have the coding skills to create it yourself? That was the position in which Bryan Conklin found himself in for the forthcoming game SiK Robot. If you think you can throw a couple of thousand bucks at a developer and get a working app back, he has bad news: he had quotes of up to $50k, and has so far–close to launch–spent $12k. 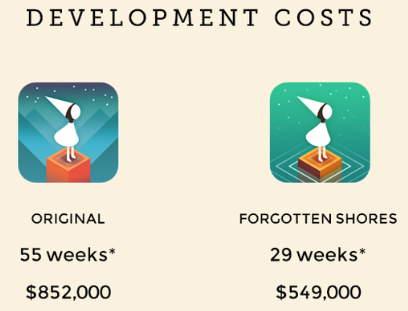 Costs were split between design and development phases. He says he learned two key lessons. First, think it all through in detail before you even approach a developer. Create a requirements list, detailing the exact functionality the app will have. If it’s a game, supplement this with a Game Design Document which describes the story, the characters, the levels, the user-interface and so on–there are templates available online for this (example). Create a wireframe view–a series of images showing the flow of the app–so that you have a comprehensive plan from which the developer will work. This stage will, says Conklin, also help you to spot inconsistencies at an early stage. Finally, the most important advice he offers to contain costs, is to apply the delete key to the requirements list. Whittle it away, he says, until you end up with a Minimum Viable Product: one that has enough functionality to be appealing to users, but without throwing in the kitchen sink in version one. If the app proves popular, the features you deleted can be added in to later versions. If you’re an app developer, what lessons have you learned along the way, and what advice would you offer to those just starting out? Do share your thoughts in the comments.